For a dragon, there’s no greater treasure than a mate—and Taine has identified his perfect match. 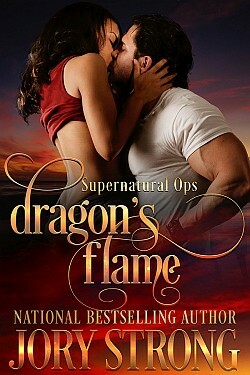 He’d like to huff and puff and burn the clothes right off firefighter Saffron Greene’s body. Thoughts of her are enough to make him lose control of his fire. And separation, after a sorcerer brings a phoenix egg into the human realm, is not an option. That leaves Taine with only one choice—claim his mate as they race to keep San Diego from burning. The scent of burning rubber and scorched paint burned Taine’s nostrils. He locked his jaw, as much in frustration as to avoid having his tongue coated with the taste of the yellow Maserati going up in flames. He’d yet to claim her and he already knew one thing for certain when it came to Saffron Greene. She was going to be a troublesome kind of mate. Sirens grew louder, as did the crowd of humans gathered to watch an expensive sports car meet its end. They held their cellphones at arm’s length, recording his loss and no doubt posting images of it to a mind-boggling number of places. He grimaced. With his luck, this would go viral and end up on the San Diego news channels, there for fellow IRE agents—and worse, his boss Maksim—to see. Then again, maybe it was a toss-up whether that would be worse than having word of his loss of control be carried back to his family in the dragon realm. They’d worry for him, might pool their treasure to buy a charm that’d shore up his magic. He was their pride, the first of his family to have enough personal magic to be able to enter this realm on his own, without incurring a debt. Watching as those closest to him tap-tap-tapped away on their phones, launching evidence of his loss of control into cyberspace, had Taine longing for the days when news traveled by messenger. Back then if a dragon wanted to prevent the spread of information, the problem was resolved by swooping down and eating the messenger. Those were the good old days. Not that he’d actually lived in those glory times when dragons dared to show themselves to ordinary humans. He was a hundred and fifty as measured in this realm, but had been here a mere twenty-five years, no time at all when compared to many of his coworkers. Taine huffed out a breath—carefully, very carefully, controlling his fire. The female attention that had been ping-ponging between him and the burning Maserati shifted to something behind him and to the right. That kind of reaction usually signaled the presence of a supernatural male. He unlocked his jaw, did the same to spine and hips, affecting a slouch and feigning nonchalance, as if it were every day he destroyed a new treasure in such a public fashion. Steps away from them, a human female with unnaturally large breasts swooned, overcome by proximity to the scion of one of the most powerful families in his and Crew’s native realm. Luckily for her, friends caught her before she crashed to the pavement. “Ha ha,” Taine said to Crew, a growl in his voice thanks to the loudening sound of the approaching fire engine. The fire consuming the Maserati flared, sending a wave of heat outward, though it was no doubt Crew’s laugh that caused another human female’s heart to flutter and weaken so she sagged and had to be held upright by her companions.